When I was a kid, I remember watching the space shuttle launches. I loved watching the launches! To think that those people would be going into space was amazing! Then, when I was in third grade there was a special launch; the Challenger would take Christa McAuliffe, a teacher, up into space. I wanted to be a teacher, so I was really excited for her! All the third graders got together and sat on the floor around the small television. Then, we watched in horror as the Challenger exploded before our very young, innocent eyes. That experience haunted me for a long time. Thankfully, that didn’t happen to the crew of the Apollo 8 spacecraft! 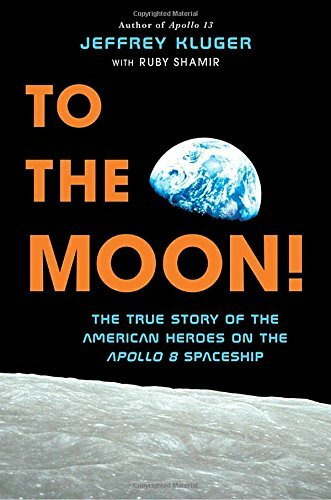 I hope you enjoy my book review of To the Moon! By Jeffrey Kluger. “The year was 1968, and the American people were still reeling from the spacecraft fire that killed the Apollo 1 crew a year earlier. On top of that, there were rumors that the Russian cosmonauts were getting ready to fly around the moon. NASA realized that they needed to take a bold step—and that they needed to take it now. They wanted to win the space race against Russia and hold true to President Kennedy’s promise to put a man on the moon by the end of the decade. So in a risky move, a few days before Christmas of that year, they sent Frank Borman, Jim Lovell and Bill Anders to the moon! I found this book fascinating! I love reading about history, especially about moments in time where people were able to accomplish the unbelievable! Moments when people come together to do the unimaginable are so inspiring! To the Moon! Is very well written! It’s nonfiction, but it reads like fiction. Seriously. It’s easy to follow and understand, and it brings the past to life. The descriptions of all the equipment and procedures are so well written that you understand exactly what is going on. It’s not boring, and it doesn’t drag on. These events were exciting in real time, and Jeffrey Kluger does an amazing job of making them just as exciting today. Even though I knew that everything turned out okay, I still found myself holding my breath and gasping when something went wrong. What an exciting time in America’s history! I may not have been alive in 1968, but this book made the whole experience part of my history. There is so much we can learn from the astronauts and the people at NASA during the space race. This book has so many lessons that they learned that are important today. I love that the book is written for YA. It should be required reading for every American history class that studies the 1960s. If your YA needs to read a nonfiction book, this would be a great choice! I highly recommend this book for YA and adults alike! The pictures at the end sum it up perfectly; I enjoyed putting faces to the names of all these people I had come to look up to.